To sum it up in one sentence: It looks promising, but isn’t quite there for my particular use case. It has a few rough edges here and there. The idea that HTML elements by itself don’t add any styling and everything is styled through CSS classes is new to me. It makes the HTML code quite verbose. Not sure whether or not I like it, but it’s different. Apple’s system font San Francisco is set to light (font-wight: 300) and I find it almost unreadable on my non-retina MacBook Air. This can be fixed easily though by overriding the respective variable $weight-light: 400. Installation was easy, but I couldn’t find an actual example page. Do you have to use .container within a section or the other way around? When do you use the level component? When the grid? I understand there’s a learning curve to such a complex framework, but the docs didn’t really help to figure things out. Overriding variables in the suggested way results in Sass errors, because the variable name $orange is not set. I tried to implement the same form in Bootstrap and got better results much faster. I found Bootstrap’s classes less confusing. The best way to evaluate a CSS framework is to start with the requirements that are non-negotiable for the project. It’s easy to (mis)judge a framework by the pretty things and I really do like many components in Bulma. I might consider Bulma again in the future for another project that is less heavy on form and input control usage than my current project. Until then, I can imagine that more full-page examples would help a lot, such as templates for a blog, shop, marketing page, a signup form, an admin area. This is a small todo app to demonstrate how to separate application logic and business rules from Ionic 2 as a framework. Almost all the logic is in a directory called core with no outside dependencies. See Ionic 2 Todo app on GitHub. Ionic 2 interacts with the core app through a single point of entry, the ItemController. For a todo app, this example might be a bit over-engineered, but it serves as a starting point for a more complex app I’m developing. Please read my other post Towards A Clean Architecture for Ionic 2 Apps to understand what I’m trying to achieve. The app is extremely light on UI stuff. There’s basically a Timer that triggers a dummy interaction after 3 and 5 seconds. But that’s not the point of the project. I checked out Hugo – a fast static site generator. Why use a static site generator? Because why would the server have to rebuild the page for every visitor instead of building it once? Especially, if content doesn’t change often. A static site generator compiles the website once and it’s served much faster to visitors. As of beginning of 2017, there is no support for removing trailing slashes from URLs, because every page generated by Hugo is a folder with an index.html. No mod_rewrite or anything. I have one requirement for my new Ionic 2 app: The core needs to work without Ionic 2. It will be released as native apps for Android and iOS, but also as a Single-Page-App (SPA). Ionic 2 is optimized for iOS and Android and not made for Web apps. Thus, I need to separate as much logic as possible from Ionic 2 and create a core application that can be interacted with through an Ionic 2 layer or an SPA. This requirement forces me to think about a clean architecture when writing Ionic 2 apps. I haven’t found the perfect solution yet, but stumbled across a few interesting ideas, concepts and articles that I want to share with you. Even if you won’t make a Web-app, I hope you can take a few ideas from this post. 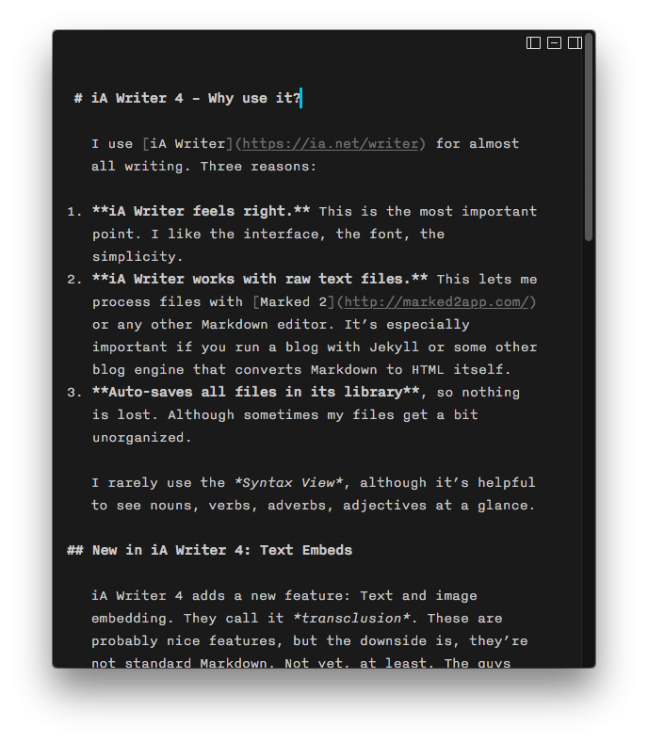 iA Writer 4 – Why use it? iA Writer feels right. This is the most important point. I like the interface, the font, the simplicity. iA Writer works with raw text files. This lets me process files with Marked 2 or any other Markdown editor. It’s especially important if you run a blog with Jekyll or some other blog engine that converts Markdown to HTML itself. Auto-saves all files in its library, so nothing is lost. Although sometimes my files get a bit unorganized. 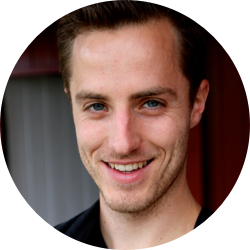 Continue reading iA Writer 4 – Why use it? I wanted to get into Web Development. Is it really that ugly, hard, and annoying? I thought: What’s the problem? It ain’t that bad, but to be honest, it really is quite difficult. Since I decided to make the new version of my app entirely hybrid, I’m intrigued by Ionic 2, Angular 2 and TypeScript. Sure, you can punch out a stupid small app in no time with Ionic 2, but something with a bit more complexity requires a few more brain cycles. Obviously, my new app has to be maintainable, needs sync across devices, I want a web UI in addition to the mobile apps and all of a sudden, I find myself in the same mess as the guy who asked on Hacker News. Use all device pixels and draw the image twice the size. This is the approach I focus on in this blog post. A basic layout for HTML5 files, a minimal version and a version for social-enabled websites. I use them often, so they are here for my personal reference. I just started to give React Native a try. I followed the tutorial, changed localhost to my MacBook’s IP address, but for some reason, I couldn’t connect my device (iPhone 5) to the React packager server, which I started via npm start in the React project’s root directory. 2016-06-22 17:03:37.615 [error][tid:main][RCTWebSocketManager.m:84] WebSocket connection failed with error Error Domain=NSPOSIXErrorDomain Code=60 "Operation timed out"
I noticed that I couldn’t open the packager server from Safari on the device as well (http://192.168.1.5:8081), which I found odd. If your iOS device can’t connect to the React Native packager server, although everything is set up flawlessly, JUST DISABLE AND ENABLE YOUR MAC’S WIFI. My other post talked about how to implement Value Objects in Laravel with Eloquent. While it’s possible technically, I don’t think Value Objects are useful in Laravel at all.